It was a warm start to our Sunday due to a southerly flow that dominated the region this morning but as a cold front approaches, rain will increase and temperatures will be dropping quickly. Some towns in northern and western Vermont have experienced a 20 degree drop in just an hour, so make sure to grab a jacket and an umbrella before you head out the door because conditions will change drastically throughout the day, mainly from west to east. Expect widespread showers this afternoon with accumulations of less than half an inch and most of us will see the rain come to an end late this evening with gradual clearing tonight. Temperatures will drop into the 20s and 30s -- big difference from Sunday morning! A cool April Fool’s Day is on tap, with highs in the 40s and a stiff wind out of the northwest- wind chills will be in the 30s so the kids will need their winter coat and maybe even gloves as they head to the bus stop but at least the sun will be out in full force. Tuesday won’t be as chilly with highs near 50 but clouds will be on the increase as a coastal storm develops to our south. 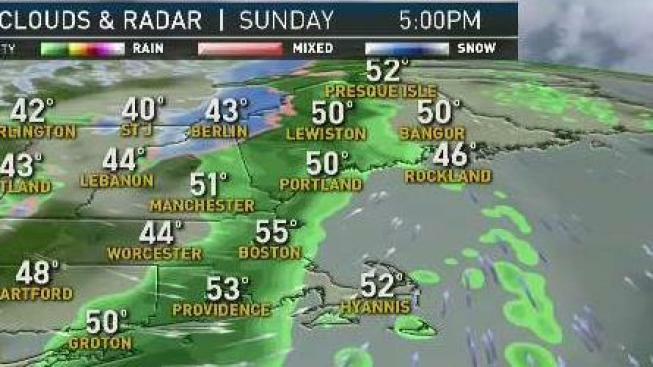 Right now, it looks like that storm may clip Southern New England on Wednesday with a chance for rain and wind along the coast, while the higher terrain may see some snowflakes. It is still too early to know the exact impacts from this storm being that the track remains uncertain so make sure to stay up to date with our First Alert Exclusive 10-Day forecast.